This line of Professional Traps was developed for the wildlife professional and incorporates several product enhancements for increased safety, performance and durability. Safeguard Professional Traps are available in Front Release or Rear Release models for easier baiting and a safer release process. All traps made of Galfan™ wire as opposed to common galvanized wire for a higher corrosion resistance, resulting in a three-times longer life. Internal bait tray travel stops. 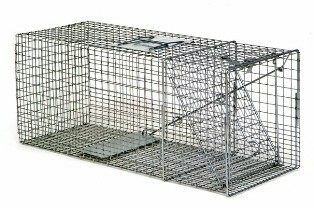 Heavy duty bait tray to eliminate damage by trapped animals. Additional operating rod support rings for superior durability. 1/2" x 1" 14 gauge wire covering the entire floor of trap to protect turf and roof shingles. Carrying handles and hand guard. Trap door reinforced to provide maximum performance and superior animal retention. **Note: Additional shipping charges may apply to certain zip codes and on multiple cage traps shipped.